Rants, raves and reviews on and about just about everything. Virgins can have opinions. Last night at the 10th Annual San Miguel Writers’ Conference, Alice Walker bemoaned the fact that women still refer to each other in groups as “guys.” Thinking in the shower this morning, what’s an alternative? Gals? Ladies? Women? Think about it. Can you hear yourselves, hum, Ladies, using any feminine term of address that doesn’t have just a smidge or an echo of diminution in it. Diminution? Is that a good word? Maybe I’m thinking “a tone of condescension.” Maybe I’ll come up with some better term for calling out to a group of my, (oh dear, shall I say it?) gal pals, when I want to get their attention. Gal pals? Yech. That tasted awful on my tongue. Help me come up with something better! What Are We Really Supposed To Be Doing? Most women, if they’ve had any exposure to the New Testament, are familiar with the story of the sisters Mary and Martha and a party in Martha’s house. Luke tells the story. He was a Greek gentile who put together a long account about the life of Jesus, and much of it focuses on the women surrounding Jesus. That is literally true, because it’s in Luke’s gospel we get the story of Mary, the mother of Jesus, how she got the news of her pregnancy, and what she thought about it. A physician, Luke must have been a good listener, a guy women could talk to. So it may have been that this other Mary, Martha’s sister, told him about what happened at the party. I doubt if Martha would have told him. Jesus is the guest, and he’s talking and sharing his ideas. The guys are sitting around listening, asking questions. The women are in the kitchen, doing what women were supposed to do, all except one. That would be Mary, the sister of the hostess. She’s sitting right down there with the guys, listening and learning. She’s not giving a thought to what’s going on any place else. This is not what she’s supposed to be doing! Martha finally has enough. “Why don’t you tell her to get up and come help me?” she demands of Jesus. He answers her, “Martha, Martha, you are troubled and careful about many things, but Mary has chosen the good part, and it shall not be taken away from her.” See? I doubt Martha would have shared that. I can hear Martha muttering, her housewife’s meter running, as she is so overrun with the work of hospitality—the cleaning to be done, the food to be prepared and served—that she risks becoming inhospitable. She’s my Type-A side, rushing to get the job done, but at too great a cost. Mary is pure Type-B, the procrastinator and dreamer, the person who knows that no small part of welcoming a guest is the ability to settle down and listen. She is my better self, the one I have to strive for. I’m drawn to the fact that this author recognizes that each of us has both Martha and Mary elements. I know I do. A large part of this summer, settling in after a cross-country move, I’ve spent going through files, trying to consolidate a vast amount of paper down to a few file drawers. I am in awe at the meticulous records I once kept. Both my husband and I were always self-employed, as well as owning jointly some rental property. We lived in the litigious and exigent state of California, so we kept each entity separate from the other, separate bank accounts, separate sets of books. I was the Master Record Keeper, the Martha of the two of us. I dutifully filed and retained every tax return and all the material to support them. We kept it all, at least records dating back to the requisite 2003, hauling the whole load with us when we moved to Mexico in 2006. We stored them in a line of formidable gray filing cabinets. Over the last seven plus years, I’ve subtracted nothing and added more records from our life in Mexico, a paper-loving bureaucracy if ever there was one. If you are an immigrant, there’s even more paper to keep track of than “normal.” Did I mention electric bills? In Mexico you are nothing, no one, without proof that you are plugged in and are paying for it. For good measure I’ve kept every statement, as well as records from Telmex, Telcel, SIAPA (that’s water and sewer), and even Global Gas. This summer all this emerged. The documents had rippled edges from coastal humidity. Rusty paperclips and staples were embedded in bundles of statements and receipts, each page containing information you don’t just chunk in the garbage. To burn or to shred? Environmentally responsible, I’ve been shredding. It is rote work. Yes, sir. Yes, sir. Three bags full. No, five. No, six. More. Evidently I have channeled Martha big-time for a long time, doing what I was supposed to do. But what I’ve also found in those filing cabinets are records of my many Mary moments – journals and correspondence kept from the late 70’s, mid 80’s, longer entries from the early 90’s. They are introspective, inquisitive, seeking and searching. Sometimes woefully dense or painfully naive, but at other times, dare I say, poetic? These are my “good part.” They tell me much more of who I am and how I’ve progressed than the many bags of now confetti-ed financial records. Here I find letters exchanged with a wise woman mentor as I struggled through the challenges of early marriage. There, I come upon reflections about overcoming cynicism in the face of one war after another. Those are a welcome resource given current headlines! I find thank you letters written to me, when I myself have been the mentor. Oh, those are nice. And here, a long letter to my parents I wrote after their Christmas visit with us in 1991. It is filled with a litany of gratitude for all that they have done, not just for Christmas, but for all my life, for how I have been raised, for the values they have instilled. My mom saved it! I find it now in a folder marked “SUSAN,” retrieved from her filing cabinets and sent on to me by my faithful sister-in-law, the one who ended up with the brunt of settling Mom’s estate a couple of years ago. Writing that letter was perhaps the best use of time I ever spent. It blesses me now, as I re-evaluate what seems a life time emerging from these ancient Penda-flex files. Could I have ever spent moments more valuable than listening and writing down my Mary moments? Oh, I will still keep financial records and file returns. I’ve just finished and filed the required one for 2013, in time to swear to myself that this year will be different. I will have records for 2014 in order, and I won’t be waiting until the last minute – again. But somehow, after this cathartic cleaning out, I’m not feeling the mantle of heavy guilt that my silently raging Martha part would impose on me. My “good part,” my Mary part, will probably keep on doing what she’s always done, even if she’s supposed to be doing something else. And that’s a good thing. I have it on the best authority. Further to my last post, here are links to the news coverage of the Marriage Vows in Mexico City. These stories appear in today’s San Angelo Standard Times. A good friend of mine, Joseph Lown, has a public face. Because of that, his private problems are now public. He has reconciled himself to this, because the issues he is dealing with are more common than most in the U.S. would think. He has chosen to step out and be featured, while still protecting the identity of his partner and his partner’s family. You can read one of many articles about him and his situation here. 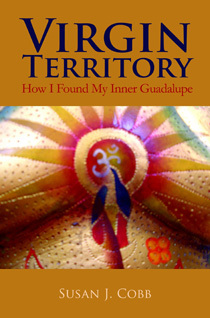 He is also featured in a recent book, Amor and Exile. Read more about that here. When the Supreme Court struck down the Defense of Marriage Act last summer, it offered the possibility of my friend’s return to the United States, specifically to Texas. That’s where his Libertarian-leaning, red-Republican, ranch-owning, FOX News-watching heart is tethered. He and I are so not on the same page in so many ways. But it was my great honor to be a participant and facilitator when Joseph and his partner “made it official” earlier this month in Mexico City. There was a reporter there, as well as a photojournalist from The San Angelo Standard Times, a Scripps-Howard newspaper so there will be more newspaper articles appearing, probably in the next week or so. What I’m sharing here are the remarks I made after the Mexico City judge performed the civil ceremony. We are here to celebrate the legal and civil union of _________ and Joseph Wendel Lown, who were formally engaged on October 13, of this year. But their commitment to one another goes back much farther. On May 19, 2009, they crossed the southern border of the United States, and came to live in Mexico. Much has been written about their situation. We who are here now, know what their love has cost them in the public arena. We are here to affirm with them that it has been worth the price. Crossing borders, leaving behind old ways to align ourselves with what we know to be something better, is a familiar circumstance in the world today. Refugee camps have become permanent fixtures in many places. Both Mexico and the United States, have rich histories of offering comfort and refuge to those displaced by fear and hatred. If it seems that, as Jesus foretold, iniquity abounds, and the love of many has waxed cold, then our job is to love more. We are here today to turn up the flame. Intreat me not to leave thee, or return from following after thee. For whither thou goest, I will go, and where thou lodgest, I will lodge. Thy people shall be my people, and thy God, my God. Where thou diest, I will die, and there shall I be buried. The Lord do so to me and more also, if ought but death part me and thee. The greatest desire held in the heart of every human being is the yearning to be their own true and authentic self. God wants us to be what He created us to be. When we mirror that desire, it is a prayer. There is no greater gift we can offer another than to support and cherish that desire. So, we are gathered here, in prayer and support, not only for Joseph and ______, but in desire for ourselves, as well. It is only through being our authentic selves that we are able to help and support them. The word “desire” literally means “from the stars.” We “hitch our wagon to a star” when we reach for something beyond what others might think we need, or deserve, or even be entitled to. It is an anomaly that with our reaching outward and upward from our authentic selves, we do not find ourselves disconnected, but rather entwined and concerned more with our fellow beings. We find ourselves in Love. Be not in haste to take the vow, “until death do us part.” Consider its obligations, its responsibilities, its relations to your growth, and to your influence on other lives. Furthermore, the time cometh of which Jesus spake when he declared that in the resurrection, there should be no more marrying nor giving in marriage, but man would be as the angels. Then white-robed purity will unite in one person, masculine wisdom and feminine love, spiritual understanding and perpetual peace. Experience should be the school of virtue, and happiness should proceed from man’s highest nature. May Christ, Truth, be present at every bridal altar to change the water into wine, and to give to human life an inspiration by which man’s spiritual and eternal existence may be discerned. In the spirit of communion, we here collectively offer our support to you, our prayers for you, Joseph and ______. We are your friends. We are your family. We will be there for you. Now, if any individual wishes to declare that support and love, this is your opportunity. Let everyone climb on their roofs and sing their notes! A louder song, sweeter than has ever before reached high heaven, now rises clearer and nearer the great heart of Christ, for the accuser is not there, and Love sends forth her primal and everlasting strain. Wow, I remember starting questions with, “Sorry…” This girl at least recognizes her tendency to do that. OK? Let’s start to NOT do that. Newspaper article preceding my talk last Wednesday in San Miguel de Allende sums up what I’m about these days. Thanks to the Education Committee of the Community Church! So another Nancy listens to spirits. It’s not Nancy Reagan; it’s Nancy Pelosi. I read the story recently published on CNS News (“the right news, right now,” which gives you some idea of the slant they offer) courtesy of a link furnished by a Facebook friend. Pelosi, perhaps speaking metaphorically, perhaps not, said that as she was being sworn in as Speaker of the House, she felt the spirits of a phalanx of advocates for women’s rights surrounding her. The CNS writer positioned that experience as evidence that Pelosi is a weird “woo woo” lady, probably a spiritualist and thus unfit for public service. I started to shrug it off as another personal attack on a woman in the public eye, and move on. Every woman of every political stripe has to deal with those attacks, from Christine O’Donnell to Hillary Clinton. But then I read the comments, and the latent urges of a former eighth grade Social Studies teacher have come bubbling to my brain and out my fingers to the keyboard. I need to put right what I DIDN’T teach to those eighth graders back in the seventies, because I didn’t know any better. I do now. Class is in session. In the nineteenth century, mediums were the only women’s voices that were actually listened to in a public space, because, of course, the medium (usually a woman) subverted her own voice in favor of the voice of the departed. That Pelosi, as a woman was elected SPEAKER of the House of Representatives, is an apt fulfillment of the dreams and efforts of those she names as having “heard” at the White House. Who is to judge that anyone in her position might be overwhelmed by the actuality of BEING where she was, not as Nancy Pelosi personally, but as a woman, as speaker. The same sentiments could conceivably move even those who do not agree with policy positions taken by Barack Obama. I speak as one who can easily find political fault with both Obama and Pelosi. But the fact remains that the election of each of them to their respective positions marks a transformation in the Nation, a transformation for the better. It shows what can be done.